Market study says vendor lock-in will continue to drive growth of build material market. A report released by industry research firm IDTechEx says the the 3D printing materials market alone will be worth in excess of US$600 million by 2025. 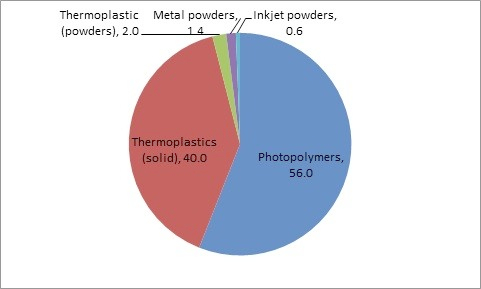 According to the report (3D Printing Materials 2014-2025: Status, Opportunities, Market Forecasts), the market for photopolymers will retain the largest single segment of the market through to 2025. Other materials are projected to gain market share as the technology matures from purely prototyping/tooling applications to final product manufacture. 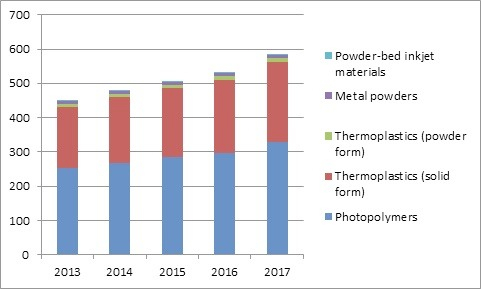 The report states that metal powders will see the highest growth, although production will remain relatively low. This, in combination with high raw material and processing prices, will cause the price of metal build material to decline slower than other materials. 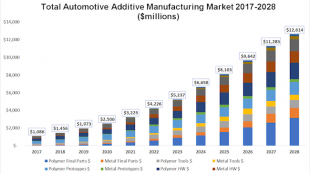 While most media attention focuses on additive manufacturing machines themselves, the report points out that the materials market for 3D printing is the most contentious issue in the industry presently. Somewhat mirroring the 2D printing industry’s “razor-razorblade” business strategy, 3D printer manufacturers are increasingly employing lock-in strategies on the build materials using key-coding and RFID tagging of material cartridges. Perceived by end-users as anti-competitive, the activity is effectively enabling monopoly pricing, while hindering development of new 3D printing materials and maintaining high barriers of entry for 3rd party suppliers. Those who do enter the market are unable to get the economies of scale required to accelerate both materials development and progress towards a competitive market. Fig. 2 Market growth in a business-as-usual scenario, when lock-in remains common practice and prices remain high. The report concludes that downward pressure on materials prices, in the short to mid-term, will be driven mainly by new 3D printer manufacturers that allow customers to source materials from 3rd-party suppliers. In addition, downward pressure will come from large end-users wielding buying power.